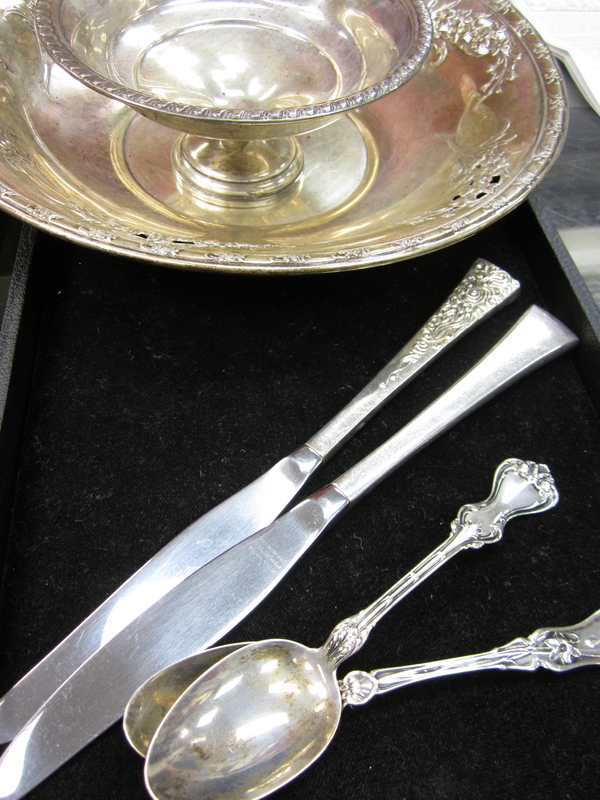 Frederick Coin Exchange is one of the area’s strongest buyers of unwanted sterling flatware, tea sets, and hollow ware. Our prices are consistently higher than both local and national competitors. The FCE staff is trained to be able to evaluate pieces of sterling using the most technologically advanced equipment available on the market. Search your house for any unwanted or broken sterling sets that you’re willing to part with. Bring in your items to be evaluated by FCE’s experienced staff. If there are items you are unsure of, bring them anyway. No appointments are needed. FCE staff will sort your sterling by content. Some items may only be plated. For those items not marked, FCE staff can test with state of the art testing equipment, which offer precise measurements of your items. The items will be evaluated using live silver prices. We make you an offer on the spot. If accepted, you will be paid on the spot. Most sterling silver will be marked with: Sterling, STER, 925, 900, 800, or a proof mark. We also do not purchase small sterling silver items, unless they are designer or historic. We are not allowed to alter your items in the store, so PLEASE remove any stones before visiting the shop! Each piece is considered potential police evidence, as we have to abide by the same laws and regulations pawnshops do. We are licensed by the State of Maryland to purchase second hand precious metals, license number 2352. Frederick Coin Exchange is one of Maryland’s strongest buyers sterling silver. You can either walk away with cash in your pocket or new coins in your collection! Think about this. How are the companies who advertise heavily on national television PAYING for their commercials? Are they really able to pay the highest prices when they’re spending $1000′s on commercials?